Looking for ways to get more involved with your neighborhood and the Bushwick community? Come out on Saturday for the much-anticipated unveiling of the Bushwick Community Plan. Bushwick is at a crossroads: Rapid gentrification continues to accelerate, while many longtime residents struggle to stay in their homes. The BCP is an effort to make sure that the community that’s been here for years has a say in where the neighborhood goes from here. “We need this process to go forward. Our people are suffering. They can’t afford to live here,” said Robert Camacho, the recently appointed chairperson of Community Board 4, who has lived in Bushwick for fifty-seven years. 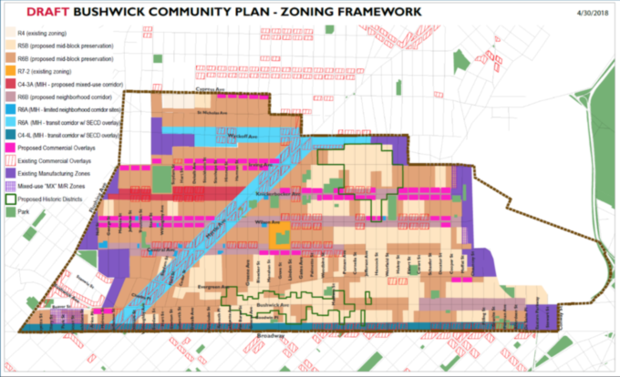 The Bushwick Community Plan (BCP) is a four-year collaboration between the community board, residents, and council members Reynoso and Espinal to proactively present the city with a proposed plan for the future of the neighborhood. The plan addresses an array of areas, including open space and economic development. But, the portions of the plan dealing with housing and land use have drummed up the most excitement and, in some cases, protest. “You start talking about land use and things are going to get tense,” said Celeste Leon, district manager for Community Board 4. And, the Bushwick Community Plan has faced no shortage of tense situations. Most recently, at a June Community Board meeting where the BCP steering committee intended to present the plan, two activist groups from local and borough-wide organizations protested, and the plan never got presented. On Saturday, the BCP steering committee hopes to finally unveil a plan that has been four years in the making. There are two main takeaways of the plan from a housing and land use perspective. The first is a demand for downzoning across most of Bushwick. And the second is a call for deeply affordable housing in areas that aren’t proposed for downzoning. The current “R6” zoning in Bushwick has been in place since the 1960’s and doesn’t put restrictions on the heights of buildings, which has enabled the out of context development running rampant in the neighborhood. As Leon and Camacho explained, the proposed rezoning of “R6A” and “R6B” would create buildings that are shorter and fatter, limiting the height of new buildings to between six and eight stories. This would help to curb out of character development, like the 28-story building currently planned near the Food Bazaar on Wyckoff. The plan also responds to calls from the community for deeply affordable housing that goes beyond Mandatory Inclusionary Housing requirements in new buildings. It recommends that affordable housing units be offered at 30 - 40 percent of AMI. Currently, affordable housing units in Bushwick are offered for as high as 130 percent of AMI, which is still unaffordable for most current Bushwick residents. Under the existing zoning, analysis from the Association for Neighborhood and Housing Development estimates that Bushwick will see around 6,300 new units go up - all at market rate, which would mean no accessible housing for low-income residents. Under the rezoning proposed by the BCP, there would be more units built, for a total of 7,500 new units, but less market-rate units and more deeply affordable units, allowing greater access to housing for longtime residents. Protesters say that the plan is enabling luxury development by even engaging in conversations about rezoning. But, according to Leon, that’s coming anyway. Plus, allowing for controlled rezoning that requires affordable housing is the only way to get the city to collaborate with them on neighborhood planning. “Often what you hear … is that there is going to be an upzoning everywhere and luxury housing is going to come … Luxury housing is coming with or without a rezoning. That’s just a fact,” said Leon. Advocacy groups are also unconvinced that the plan itself will succeed in convincing the city not to do mass rezoning that will harm longtime residents. At a meeting last week to discuss rezoning in Bushwick, Alicia Boyd, founder of Movement to Protect the People, voiced those concerns. “For the record, no community of color has ever got a downzoning,” Boyd told the crowd. Jose Lopez, Co-organizing Director at Make the Road and a member of the Bushwick Community Plan Steering Committee, said he understands that perspective. “I don’t blame activists and organizers for their efforts in saying that the city can’t be trusted. We have yet to see a rezoning that 100 percent reflected what communities in other places have called for,” he explained. But, he still feels strongly that Bushwick should take a proactive approach with the city. “Let’s not play defense. Let’s play offense. Let’s create a community plan that we control. Let’s make that plan as good of a plan as we can make it. Let’s tell the city: if you plan on setting your sites on Bushwick, the only way we’ll allow it is if you use the plan we’ve put forth,” said Lopez. Then, he said, if the city comes back with something that does not mirror what the community has put forth, the next best option is no-action. Bad rezoning will be more detrimental to the community than no rezoning at all, he explained. The team behind the BCP includes housing experts from local advocacy organizations, including Make the Road New York, Churches United for Fair Housing, and Riseboro, that all worked to collect feedback from the neighborhood and incorporate it into one cohesive plan. According to Leon, that type of collaboration is unprecedented. The Bushwick Community Plan Release will take place from 11:00 a.m. - 2:00 p.m. on Saturday, September 22 at 400 Irving Avenue in Bushwick.